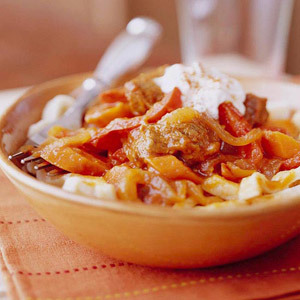 Depending on how much heat you like, choose sweet or hot Hungarian paprika to spice this goulash. In a 3-1/2- or 4-quart slow cooker, combine meat, carrots, onions, and garlic. In a small bowl, combine broth, tomato paste, the 1 tablespoon paprika, the lemon peel, salt, caraway seeds, black pepper, and bay leaf. Stir into vegetable and meat mixture in cooker. Cover and cook on low-heat setting for 8 to 9 hours or on high-heat setting for 3-1/2 to 4-1/2 hours. If using low-heat setting, turn to high-heat setting. Stir in sweet pepper strips. Cover and cook for 30 minutes more. Discard bay leaf. Serve with hot cooked noodles. Top with sour cream or yogurt. If desired, sprinkle with additional paprika. Makes 6 servings.